Pipeline Innovations’ Pathfinder foam caliper tool has once again demonstrated its unique ability to provide high quality bore measurement data whilst operating in some of the most difficult and challenging pipeline conditions. The Pathfinder tool not only managed to get through a pipeline that would have seen a standard gauging pig stuck in the line but it also collected valuable data that allowed a crucial decision to be made on the future of the pipeline. The pipeline, located in the North Sea, consists of two 8” production flowlines connected at a subsea manifold to create a pigging loop. The flowlines which were constructed in 1996 are due for ILI inspection but have never been pigged. Production wells feed into the flowlines at a number of tie-in points along the line. 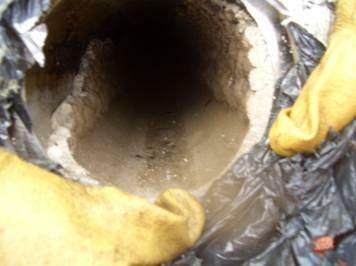 During decommissioning of one of these wells, barium sulphate hard scale deposits were identified which were causing bore restrictions in excess of 20%. It was unclear whether these deposits were local to the well or whether they carried over into the flowlines 60m downstream. 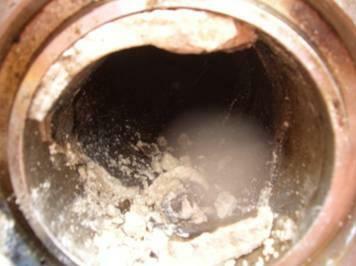 It was also unknown whether any of the other wells feeding into the flowlines were producing deposits. As the flowlines had never been pigged and there was the possibility of unknown quantities of scale deposits in the line, then there was a concern that using hard bodied pigs to clean and gauge the line might result in a pig becoming stuck. In order to mitigate the risks of pigging, PIL were approached regarding use of the Pathfinder foam caliper pig for proving the bores and estimating the extent and distribution of scale deposits prior to the use of hard bodied pigs for cleaning and inspecting the two pipelines. Two 8” Pathfinder pigs were produced by PIL and mobilised to the platform in the summer of 2015. The first Pathfinder pig was launched and took 15 hours to run through the loop. The pig was recovered in a good condition without any damage to the pig body. The data file was offloaded from the pig and checked to ensure that good quality data had been obtained before loading and launching the second Pathfinder. The second tool was launched, again taking approximately 15 hours to complete the loop and return to the platform. This pig was also received undamaged and in good condition and it was confirmed that a full set of good quality data had been obtained. 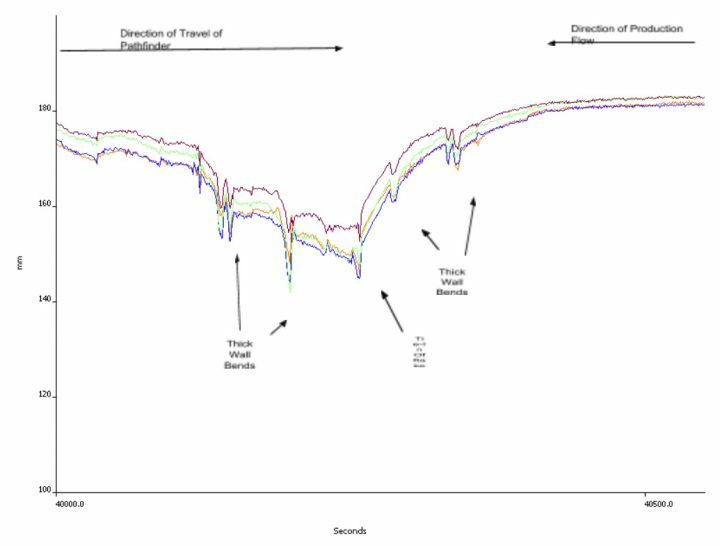 The caliper data sets from the two Pathfinder pigs were found to be in good agreement with each other and also with the pipe bores listed in the pipeline records. At the suspected problem tie-in, flowline internal bores were found to gradually reduce from 184mm to 141mm over a distance of around 100m. At the tie-in, the minimum diameter (147mm) was in the vertical direction and the maximum diameter (155mm) was across the horizontal direction, suggesting that the thickness of deposits was greatest in the bottom quadrant of the pipe. Clear feature indications and a high data correlation with the pipebook allowed accurate distance and positional measurements to be made. The graph shows the bore variation from 100m upstream of the tie-in to 100m downstream with the maximum deposit thickness occurring at the tie-in point. No deposits were found at any of the other tie-ins. The information provided by the Pathfinder data was used by the client to drive a critical decision to replace a 60m length of the most heavily affected section of the flowline rather than attempting to remove the deposits with cleaning pigs. The data also allowed the client to provide an accurate topsides internal bore diameter map to the ILI vendor, allowing that vendor sufficient time to ensure an effective bore kit solution be implemented on their tool. The Pathfinder has again demonstrated its ability to provide a low risk bore proving solution for a pipeline with multiple high risk factors. Without Pathfinder data, timely solutions could not have been implemented on this project and the ILI inspection would have likely been deferred long term.